If you desire to see your ambition realized - it's time to move on it NOW! People with the osprey totem know how to go after what they want. They also know how to hold onto it once they get it. Thus they can dive deeply into the pools of creativity and draw forth what they need to move forward. Like the falcon, folks with this spirit animal have impeccable timing in all matters. They also know exactly when to grab at opportunities. These folks tend to treat others with a great deal of respect, regardless of how they feel about them. They always maintain their integrity even in a clash of wills with another. When you have an osprey dream in which it is standing on top of a mountain, a rock, or a cliff it, means success in your new job or business. This bird of prey in your vision can also represent that you are returning from a journey. Alternatively, this bird can be an omen of success and profit if it comes close to you and speaks to you in a dream. Fighting with this bird in your vision means that you are fighting people in authority. My sister and I were driving to a nearby town to deliver some furniture to a lady in need of it and as we were driving an all white bird flew over my truck. I am not sure if it was a hawk or an osprey. But it definitely was a raptor and it was all white except for some light brown on the underside of its wings. It gave me goosebumps and I would lime to know its meaning. If it looked different from the osprey in the pics then it was likely a bird of prey called a “kite” they don’t have the brown stripe on their face, and are generally more white in color. 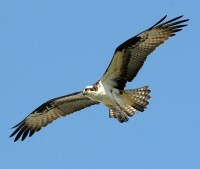 I was out riding my bike and a osprey flew over my head with a fish in its talons. I watched as the osprey headed north and continued to fly a good 20 miles until vanishing. The next week, same spot an osprey flew over my head low and could see the fish’s tail moving as it was being held. This one flew southeast and vanished after a mile or two. Fortuitous that I read your post today. 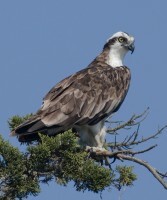 I saw an osprey this morning, right overhead, with a big fish in it’s talons. And I was stopped at a stop sign, so that was lucky that I was not driving and could stare at it, ascertaining that I was seeing what I was seeing. It was so unexpected, so exceptional. So I am asking myself, what the heck does this mean, especially as I was fervently asking for strength and direction regarding family matters (prompted by a song that had come on the radio) at this very time. Well, it is just a relief to know I am not alone in such a visit by an osprey holding his catch. 2 days ago in the church yard next to my house an Osprey came down and grabbed a full grown grackle. The grackles mate was attacking the bird trying to save him, but the osprey just flew away with the bird in his talons. This was not a dream, it did happen, I even got pictures of it. But my life has always been filled with strong symbolism so I don’t want to ignore the message. I play a Native American Flute. I only play one song that varies each time I play it. I cal the Song “What Comes Out” I went from Missoula MT to California last Oct. to visit my Mother in Apple Valley California. She jokingly asked me to do a Rain dance for them last Aug. I made a humorous video with a joke rain dance but made plans to do a real one once I got there in Oct. I completed my rain dance by playing with my feet in the Pacific ocean and visualizing the water evaporating and coming down as rain, as well as news paper headlines stating harshest winter in years hits California, and alluded to ending of the 5 year drought. When I bought my first flute it had a hawks head carved on it. I played a few miles from the battle of little big horn on the Crow Reservation ( I am of Swiss German, German and Swedish heritage) The hawks loved the sound. I no longer have that flute I use an F# tuned to 432Hz. Now My mother gave me a cheap metal necklace of two feathers, while I was visiting. I eventually attached it to my flute ,but it was lost one day while in downtown Missoula. I was feeling very low on June 21st it was a Wednesday. I was walking along the Clark Fork river Trail with my flute, and I found an Osprey feather, I walked a bit further and found another. So it is that the Great Spirit replaced my necklace with two real Osprey feathers. Hence the Name Two Feathers. I have considered the Hawk my Spirit animal from the day I played my Hawk flute and the hawks danced for me above my head as I played. Blessed Be. 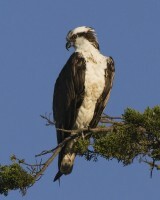 I woke to the sounds of osprey outside my window this morning. I watched 2 adults guiding their youngster around the area. It appeared they were teaching it. I felt like it was just for me to see. Now I’m looking forward to a beautiful day. :an osprey shaddow lead my car down a windy road of wisdom today. Hello – One evening around 7 pm, I was sitting in my driveway and there was a large osprey sitting at the very top of a tree next to my home. The wind was blowing extremely hard, but the only thing it did was flap its wings a few times, which was sort of odd to me. A few hours later I went back outside out of curiosity, it was still there. A few hours later maybe around midnight, still there, wind still blowing. Around 3 am, still there. Woke up around 6 am looked out my window still there, was leaving around 7:30 called my sister to come see, it was gone. After work around 6:00 p.m. I went to pick up my then girlfriend who lives about 5 miles from me, as I turned the corner from her house there was a dead Osprey on the side of the road. I’d never seen an Osprey, and haven’t seen one since. I’ve been trying to find the significance of this, but just cannot wrap my mind around it. My ex and I broke up after 14 years, so it seems like maybe that was our relationship dying?…I also thought maybe that whatever what hunting our relationship for the past year or so, the Osprey “sucked” to up as sacrifice to hero us but we just couldn’t make it? Any insight would be soooooo appreciated. Thank you Very Much!!! This web site is Great and inspiring !!!! !